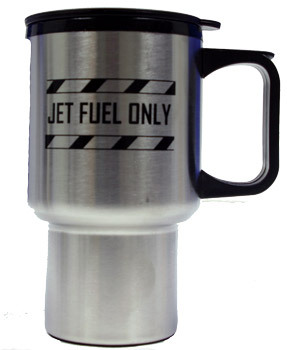 Make sure you get the right fuel in your travel mug with this stainless steel JET FUEL ONLY travel mug. This 14 oz. stainless steel, double-wall insulated mug, helps your personal fuel stay hot or cold in either the hangar or the air. Padded non-slip bottom, no-spill lid, 5.75" tall.